Spend your summer in Tuscany 2014 near the sea! 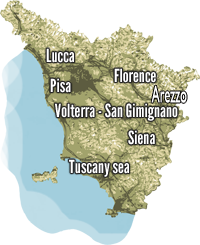 Divina Toscana offers a fine selection of holiday cottages and holiday homes near the coast. In our catalog troverte apartment a short walk from the beaches and nice and cheap farm a few miles from the sea. Spend a Weekend in beautiful Tuscany surrounded by nature and the green Tuscan hills. The Old farm with horses and restaurant is located in the heart of Tuscany between Volterra and the Etruscan Coast. First floor with balcony to eat outdoor, large livingroom with kitchen, sat TV, sofa bed. Kitchen equipped with dishes, stove, oven and fridge, 3 double bedrooms, 2 bathrooms with shower.